Look for our new specialty flavor each month! Coffee flavored donut. Dipped in chocolate glaze and drizzled with Walden Farm’s Caramel. Topped with a dark chocolate covered espresso bean. Traditional spiced carrot cake donut. Topped with whipped cream cheese / coconut cream frosting and garnished with roasted organic walnuts. 5 pro / 9 carb / 6 fat = 115 cal. We deliver to any Omaha location you provide, work or home. for flat $5 add-on. We believe people shouldn’t be deprived of donuts because they aren’t in alignment with your health goals, and that you should be able to #cheateveryday. So we created a protein donut that tastes so good you wouldn’t know it’s anything but a good freaking donut. What you eat matters. How good it makes you feel matters. And whether or not it tastes good enough to make you want to continue doing it for the consistency of your lifestyle is important. Using food as medicine, and as a form of love and respect to your own self matters to us, too. You have goals, and we want to help you meet them without having to sacrifice. We know just because a company uses the word "fit" doesn't mean they use ingredients that will actually nurture your body. 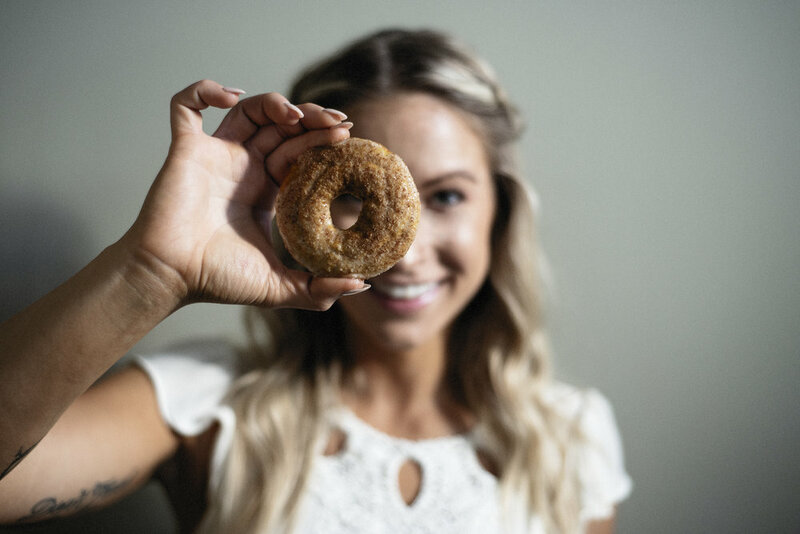 We've seen endless studies linking processed sugars, starches and fats to chronic disease, which have helped us gain awareness surrounding what we choose to make our donuts. But we promise we’ve never made any shortcuts. We craft our donuts in small-batches, and bake each dozen (never fry) with our full positive intentions. Did we mention we're talking about donuts? Because they're super duper delicious. Donuts made with stuff you actually recognize. No artificial sugars, no ridiculousness. 100% pure whey isolate, gluten-free flour blend (), coconut oil, eggs, pumpkin, unsweetened applesauce, honey, guar gum, stevia, apple cider vinegar, baking powder, vanilla, pink salt, cinnamon. Depending on flavor, may include cocoa powder, peanut butter, additional spices. GNC Twin Creek, Bellevue, NE. Approach Climbing Gym, Omaha, NE. Donuts are Holly’s bliss. They have always been the object of her affection, and even during her competitive bodybuilding years, one of her favorite “cheat” foods. Now, as a certified Holistic Health Coach with the Institute for Integrative Nutrition, and a certified personal trainer with the American College of Sports Medicine, Holly practices and teaches about balance. She believes in delicious pastries and that health is our own responsibility. She thinks just because you have a food sensitivity, allergy or health goal doesn’t mean you should be left out. 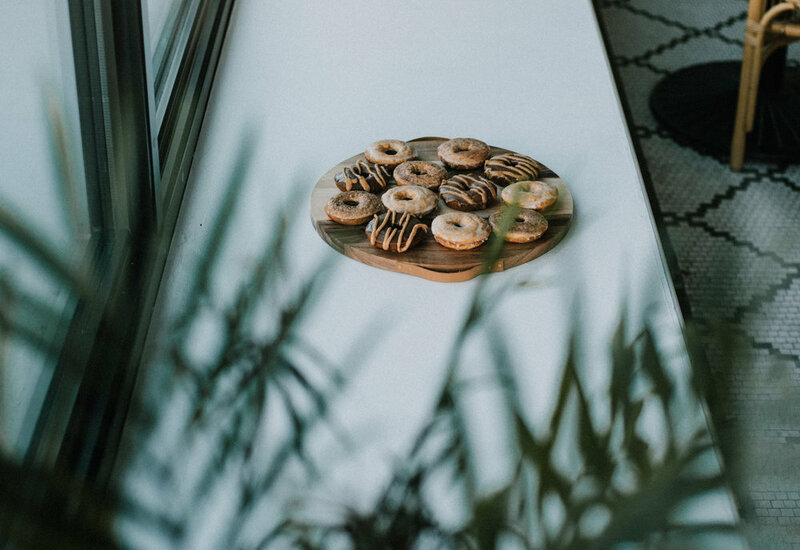 Holly’s vision is to contribute to her community by providing healthy pastry options we didn’t know existed, and more scrumptious options to make self-respecting choices as we take our wellness into our own hands. is an Omaha native who played D-1 football at Kansas State where he got is undergrad in Finance. After Kansas State, he got his MBA at University of Nebraska Omaha and then played professional football in Germany for 3 years. When he completed his football career, he began competing in Cross-Fit where he qualified for the 2012 Regionals. It was during his Cross-Fit career that he began learning more about health and wellness. Due to a torn knee, John never competed in Regionals, and ultimately gave up on Cross-Fit because of injuries, but took the knowledge he gained in pursuit of a balanced healthy life. John met Holly in early 2018. This is when John learned about Holly’s famous protein donuts and had to try them! Immediately he knew there was a need for her donuts everywhere and encouraged Holly to follow her dreams. A couple months later, they started Holly’s Healthy Holes, so now everyone can #cheateveryday while living a balance healthy life!